This year has been a great year for the smartphone industry. Lot of amazing smartphones have been released this year and many more are yet to come. But for now the Samsung Galaxy S7, LG G5 and HTC 10 are top on the list. How would it be if these go head to head with each other? Let's find out. Galaxy S7 - The S7 has corning gorilla glass 4 on its front and back just like it's predecessor’s design except that it now has its glass curved on the back rather than being flat. The phone is IP 68 certified which means that it is dust and water resistant. The phone will easily survive if it falls into a bucket of water or into the pool. The S7 is available in Black, White, Gold and Silver colours. 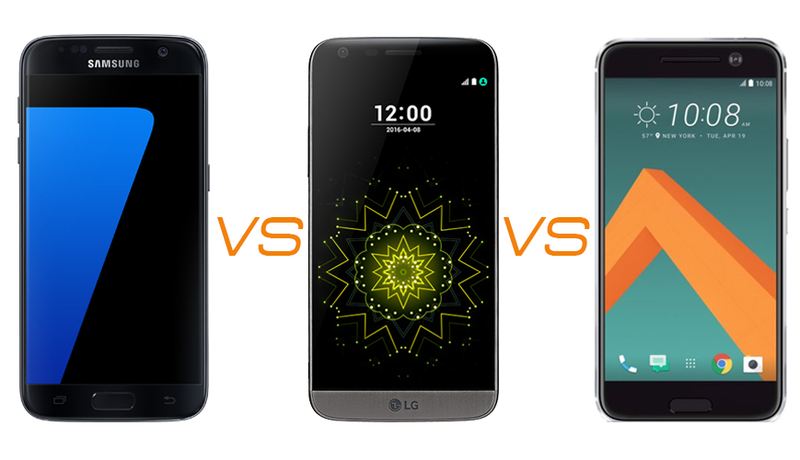 LG G5 - The design of G5 is completely different from its predecessor. It has a unibody metal design and has plastic lining on the chamfered edges. The LG G5 is the first ever modular phone to be released. Basically the under part of the phone which is so called ‘Module’ can be swapped with a camera or audio module which is made by LG itself for a better camera or audio experience. It has a fingerprint scanner on the backside of the phone just like Nexus 6p or Nexus 5x. The G5 is available in Silver, Titan, Gold and Pink colours. HTC 10 - The HTC 10 has a full metal body and looks very simple. The legendary boom sound speakers of HTC have now been removed and a fingerprint scanner has been introduced. Instead of the boom sound speakers it now has a small speaker on bottom of the phone and one big speaker for higher frequencies beside the ear piece. The HTC 10 is available in Carbon Gray, Topaz Gold and Glacier Silver . Galaxy S7 - It has a 5.1 inch Quad HD super AMOLED screen with a resolution of 1440 x 2560 (577ppi). The screen is made of Corning gorilla glass 4 and can easily survive few heavy drops. The display is one of the best looking one in the market after the Sony Xperia Z5. The color, text and everything else on the display would be really pleasing to the eye. LG G5 - It has a 5.3 inch IPS LCD screen with a resolution of 1440 x 2560 (554ppi). The screen of G5 is also made of Corning gorilla glass 4. The display is really dim and the user has to strain his eye to see the display in the bright light outdoors. HTC 10 - It has a 5.2 inch Super LCD screen with a resolution of 1440 x 2560 (565ppi). The screen of HTC 10 is also made of Corning gorilla glass 4. The colours on the display are very vibrant and look very appealing to the eye. Galaxy S7 - It has two variants. One is powered with Exynoz 8890 with Mali T880 MP12 as the GPU. Another variant is of Snapdragon 820 with Adreno 530 as the GPU. It is boosted with 4 GB ram and has 32/64 GB as internal memory. It has micro SD slot for expandable storage. The performance on this phone is top notch. Multi tasking is really smooth and the camera responses very fast. LG G5 - It is powered with the Snapdragon 820 chipset with Adreno 530 as the GPU. It has a dual core processor and is boosted with 4 GB ram. It comes with 32 GB internal memory and is expandable to 200 GB with a micro SD card. The performance on this phone is really solid with no lag and with its LG Optimus UI the animations look very smooth. HTC 10 - The HTC 10 is similar to that of LG G5 but also comes in a 64 GB variant. The performance is top notch with no lag and the multi tasking can be done without any problem. Galaxy S7 - The S7 has a 12 MP shooter on the back with OIS and a 5 MP shooter on the front. Though the MP numbers are less than its predecessor the camera has f/1.7 aperture which produces amazing pictures. The auto focus is ridiculously fast and in fact is the fastest compared to any other smartphone. The only downgrade is that it produces grainy images in low light. The picture quality is amazing in bright light and the colours in the images look very warm and vibrant. LG G5 - The G5 comes with a dual camera set up. The main one has a 16 MP f/1.8 aperture and the next one is a wide angle lens with 8MP. It has laser autofocus and produces stunning images. In low light or bright light, indoor or outdoor any person will have a great experience using the camera on this phone. We can even swap the ordinary module with a camera module for even better experience. HTC 10 - The HTC 10 has a 12 MP rear camera with f/1.8 aperture and built in OIS and has a 5MP shooter on the front which also has OIS. It has laser autofocus but the images produced are just above average. They are good in bright light and are not over saturated. The front camera is really good and would be perfect for good selfies. Galaxy S7 - It has a Non removable 3000 mAh battery which can easily last a full day with 4-5 hours screen on time. It comes with a microUSB port and supports fast charging and wireless charging. LG G5 - It has a removable 2800 battery. It has a USB type C port for charging. The phone may die just before the day ends but as the battery is removable it can be easily swapped with another one. It also supports fast charging and can get up to 70% of charge in 30 mins. HTC 10 - Just like the G5 the HTC 10 also has a USB type C port but has a bigger battery than the G5. The battery life on the HTC 10 is truly amazing. The phone may last a whole day on a heavy usage and two days on a normal usage. It also supports fast charging but not as fast as that on the G5. Galaxy S7 – Great display, IP 68 certified, battery life, camera (good lighting), fast charging, wireless charging and fast performance. LG G5 – Great display, Modular design, fast charging, camera and fast performance. HTC 10 – Bright display, battery life, fast charging , design, OIS for front cam and fast performance. Galaxy S7 – Camera in low lighting, speaker, Slippery phone and fingerprint magnet. LG G5 – Dim display, missing app drawer and less battery capacity. HTC 10 – No wireless charging, rear camera and no boom sound speakers.